The Fitaly keyboard for the Palm Organizer is an ergonomic replacement for the standard on-screen Qwerty keyboard. The patented Fitaly key arrangement is optimized for pen entry: the letters ital ne dors and the space – together representing 73% of the keys used for normal text – are placed in a very tight central area. Adding the letters ch and um brings this frequency to 84%. Remaining keys are never more than two keys away from this central area and each key is placed near the keys most likely to follow it in text. The effect is to minimize pen travel. In addition, the layout practically eliminates hand movement when typing text. This means that you can type with your hand rested on the lower part of the organizer, moving only the fingers holding the pen. FitalyStamp is a version of the Fitaly keyboard that works as an overlay on the Graffiti area. 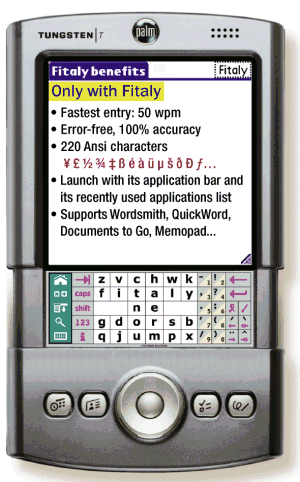 As a Fitaly keyboard, it retains the unique speed advantages of the Fitaly design as well as speed features such as the use of sliding to enter capital letters and numbers. 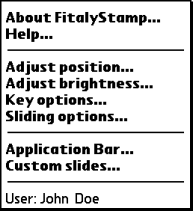 FitalyStamp is also a launcher, with an Application Bar and a list of most recent applications. As FitalyStamp completely overlays the Graffiti area, it has to provide its basic functions in another way. The main function of input is provided by the Fitaly keyboard itself with four panels called the left, letter, punctuation, and right panels. Remaining functions are provided with five icons included in a green side bar on the left. The side bar includes the icons for the Application launcher, the Calculator, the Menu, and the Find command. It also includes a keyboard toggle to turn FitalyStamp on or off. The left panel includes the tab, caps lock, and shift keys, and the 123 toggle to alternate between the letter panel and a panel with numbers. The information key opens a menu with several options for FitalyStamp. The letter panel includes two large space bars and the 26 letters of the alphabet in the patented Fitaly layout - named after the second row. The punctuation panel includes punctuation keys. Alternate keys are obtained by shifting or in combination with accent keys. Lower triangles indicate digits that can be entered either directly or by sliding, that is, by moving the pen sufficiently far before releasing it. The right panel includes the backspace and enter keys. The shortcut key is used to enter Graffiti shortcuts. The command key is used for menu commands. Slides from command to shortcut set the Palm in Control state. The lower four keys include accent keys – obtained directly – and arrow keys – obtained by sliding. The four accent keys are sticky keys. A tap on an accent key modifies certain keys of the letter and punctuation panels. This is a one-time effect that only applies to the next letter. For a field, the left double arrow moves to the field before, the right double arrow to the field after. For text, the left double arrow moves to the line before, the right double arrow to the line after. Tapping on the FitalyStamp Toggle toggles off the function of the keyboard. To restore the FitalyStamp function, tap on this toggle again. The letter panel and the punctuation panels can be modified in various ways to produce all the 220 characters of the Latin1 character set with these modifications – something that no other keyboard allows. Let us start by the 123 key. A tap on the 123 key pops up a panel with numbers and the keys most often used in conjunction with numbers: currency symbols, such as $ ¢ £ ¥ €, the degree ° and mathematical symbols. The right side duplicates the punctuation panel. 123 key again or outside the number panel on the screen. You may not use these symbols every day, but if you need them, they are on the Fitaly. Actually, the Fitaly is the only way to enter some of these characters on a Palm Organizer. While the number panel is on, you can tap keys either on the number panel or on FitalyStamp. The effect of shifting on letters is, as expected, to get upper case letters. 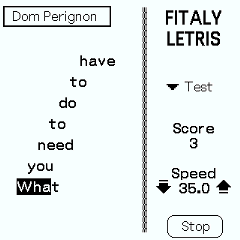 The effect on keys of the punctuation panel is as shown in the above popup screen. A tap on any of the four accent keys pops up a panel with accented letters and other characters of the Latin1 character set. For example, tapping the circumflex accent ˆ followed by e produces ê. This means that each accented key can be produced with only two taps. In addition, this also displays alternate keys for the punctuation panel. Accent keys are one-time modifiers so that the popup panel disappears immediately after a tap on the key. The display is optional. For example, you may want to show punctuation panels but not letter panels and tap accented letters on FitalyStamp itself since the position of accented letters is easy to infer. We now review the four accent variations, along with their effect on the punctuation panel. The acute accent changes the vowels to vowels with an acute accent. It also changes the letter c into ç and C into Ç (in shifted form). The punctuation panel shows all currency and legal symbols. With shifting and the acute accent, the letter panel appears as shown on the right. The grave accent changes the vowels a e i o u to accented form. It also changes the letters d and t into the Icelandic ð and þ. Similarly, D T are changed into Ð Þ. The circumflex accent changes the vowels as expected. But see also how it changes the letter s and S into š and Š. The punctuation panel offers two-tap access to any of the brackets. The umlaut key changes all vowels to vowels with umlauts. In addition, the letters m n s become µ ñ ß and N becomes Ñ. The punctuation panel offers two-tap access to useful symbols such as @ and &, as well as the bullet •. In addition, it can be configured to include the card suits as shown on the right. The command key is used for menu commands: a tap on the command key followed by a letter activates the proper menu command. For example, you can use either U or u for undo. The shortcut key is used for Graffiti shortcuts. To type any of the shortcuts, tap this key either before or after those of the shortcut. For example, tap either ds or ds for the date stamp. The main purpose of Fitaly is fast typing on a palm device and most characters can be entered with one or two taps. However, when upper case letters are frequent, as in addresses, repeated shifting can be cumbersome. Similarly, when letters and digits are intermixed, toggling 123 repeatedly can become inconvenient. This is why FitalyStamp offers sliding: Sliding happens when you tap on a key and then move the pen sufficiently far before releasing it. When you tap a letter, you see it appear at key down. If you slide, a backspace is emitted followed by the revised letter at key up. Sliding any letter capitalizes it. If All Caps is on, sliding gives a lower case letter. Note that for letters, we can have different effects for short slides and long slides. Capital letters are the default for long slides. Sliding any of the punctuation keys produces the digit shown in the lower triangle. The slide direction does not matter. Sliding any of the space keys backspaces. When entering text, you tend to use backspaces for corrections. But for editing, you would often prefer to have a delete key. You get the effect of delete by sliding the backspace key. Fitaly uses sliding to accelerate the entry of accented letters: sliding a letter to produce an accented variation is significantly faster than doing a tap on an accent key, followed by another tap on a letter. For the other directions, this is more of a convention. In any case, what you get for the grave, umlaut, acute, and circumflex directions are the same letters that you obtain by a tap on the accent block. For example, this means that a slide up from s gives ß. The assignments for ligatures are somewhat arbitrary: positions starting with a and o would be more intuitive but they are already occupied. Given that some slides are somewhat arbitrary, it makes a lot of sense to allow them to be changed and Fitaly allows the definition of custom slides. As you will see, custom slides offer a general macro capability and they are also used to activate Fitaly's launcher features: the list of Most Recently Used Applications and the Application Bar. Note that having accent slides does not prevent the use of sliding for capitals. For letters that have accented variation, the distinction can be done by the direction and also by the length of the slide. Finally, note that Fitaly also offers passthrough slides: wide slides between the underlying silkscreen buttons that are passed through to other applications. A tap on the information key opens the information menu. Adjust position opens a dialog that allows the Fitaly software to recognize the current position of the stamp on the silkscreen area. Adjust brightness opens the brightness dialog. Key options, Sliding options, Application Bar, and Custom Slides open FitalySetup directly at the corresponding panels. Practice. Practicing the same sentence again and again will increase your overall typing speed on new text. FitalyLetris. When you install FitalyStamp, you have the option of installing also the word game FitalyLetris. It is a great training aid to build speed with frequent words. Light touch. Very light tapping and “dancing” over keys will improve speed. Light taps are also much less tiring as well as more gentle on the screen. FitalyStamp looks like a demo. What can be done? Registration information is managed by FitalySetup. You need to enter your registration in FitalySetup. What to do if taps on FitalyStamp only produce dots? The first thing to check is that FitalyStamp is currently enabled: On the Palm OS3 and OS4 version, check in X-Master; on the Palm OS5 version, check the FitalyStamp icon. Dots may also result from a conflict with some other application that intercepts taps on the Graffiti area. A list of known incompatible applications is in the additional installation notes. What to do if taps produce random letters? If problems subsist, they are likely to be due to a digitizer malfunction. Setting the Sure mode option may compensate for mild problems. For more severe problems, repairing the digitizer is the only solution. See the online FAQ on this subject. What to do if custom slides don't work? The most likely reason is that one or more of the Sliding options are not properly set. The easiest way to reset the default values is to go to the Test Options panel of FitalySetup and tap on the Reset options button. Where to go for new ideas, new versions, the FAQ, and support questions? Visit the forum also to learn about new versions as they are developed and made available to users. A separate forum is available where you can find tips and answers to Frequently asked questions. Information in this document is subject to change without notice, and does not represent a commitment on the part of Textware Solutions and JDI Technology, Inc. The software described in this document is furnished under a license agreement. The software may be used or copied only in accordance with the terms of the license agreement. It is against the law to copy the software on any medium except as specifically allowed in the license agreement. No part of this manual may be reproduced or transmitted in any form or by any means, electronic or mechanical, including photocopying, recording, or information storage and retrieval systems, for any purpose other than the purchaser's personal use, without the express written permission of Textware Solutions. © 1998-2004 Textware Solutions and JDI Technology, Inc. US Patent 5,487,616. Others patent pending. Instant Text and Textware Solutions are registered trademarks of JDI Technology, Inc. Fitaly is a trademark of JDI Technology, Inc. Other brand or product names are the trademarks or registered trade-marks of their respective holders. Software design with the participation of Alan Jay Weiner and Bozidar Benc. Copyright © 1998-2004 Textware Solutions.